Thanks to the advent of 3D V-NAND and other new flash memory technologies, solid state drives are getting both larger and less expensive all the time. While SSDs are still considerably more expensive than hard drives with the same amount of storage capacity, the cost differential is now smaller than ever. A perfect example is the new Samsung 860 EVO 2TB SATA III Internal SSD, one of the largest commonly available solid state drives on the market today. I recently had the opportunity to check one out, and I came away quite impressed. While there are faster SSDs out there, the EVO 860 2TB drive is plenty fast enough to put any computer into overdrive if you install it in place of the existing hard drive. What’s more, it’s plenty large enough to hold your computer’s operating system and installed programs and apps plus tons of photos, music and video files. To put the size of this drive in perspective, most consumer-grade PCs on the market today come with hard drives in the 500GB to 1TB range. That means this small 2.5 inch form factor SSD will hold up to four times as much data as the drives that come pre-installed in those machines. The 2.5″ form factor and standard 6 Gbps SATA connection enables this drive to slide right into place inside most any laptop, and it’ll also work in most desktop PCs with the aid of an inexpensive 2.5 to 3.5 inch drive adapter bracket . This is a low-power drive that runs cool to the touch, meaning your laptop will run longer on each battery charge while also running slightly cooler. Bottom line: This is an outstanding solid state drive. If you’ve been looking for a super-fast SSD that’s large enough to hold everything that’s currently on your hard drive and more, this awesome drive from Samsung is about as good as they come. 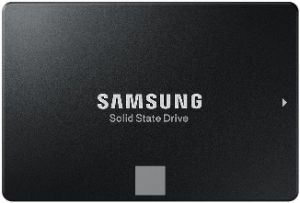 Click here to check out the Samsung 860 EVO 2TB SATA III Internal SSD at Amazon, including over 800 overwhelmingly positive user reviews.